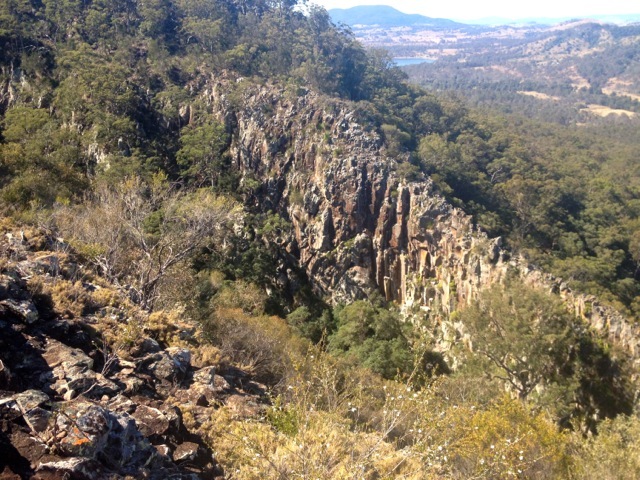 At nearly 1000m above sea level, Mt Maroon stands out because of its jagged rocky parapets. 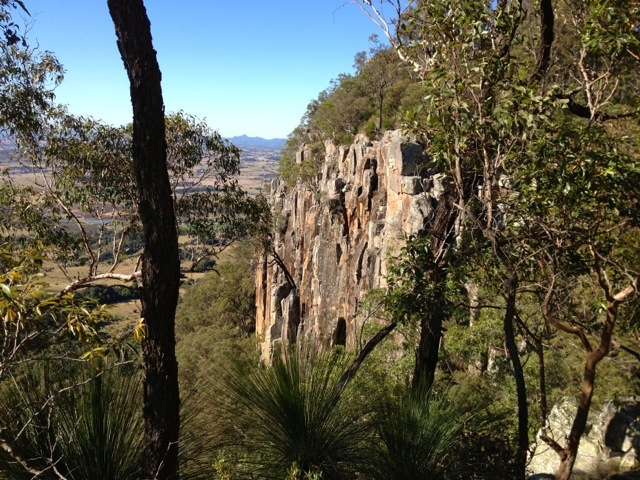 Today’s my second walk in the Mt Barney National Park, having walked to the Lower Portals yesterday. Similar to yesterday, I arranged to meet the group at the sleepy town of Rathdowney. Once the small group had arrived we drove to the trailhead. The walk begins at a pond and as ducks frolicked in the water we headed along a grassy path. 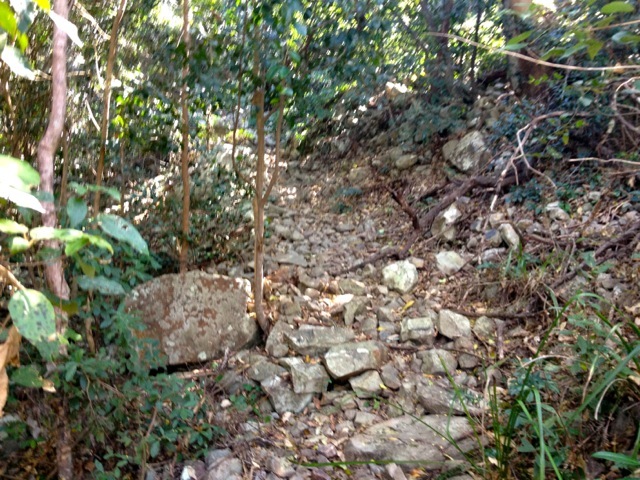 The path turned quickly to dirt and then to rock as it climbed, initially at a slight gradient before getting steeper. 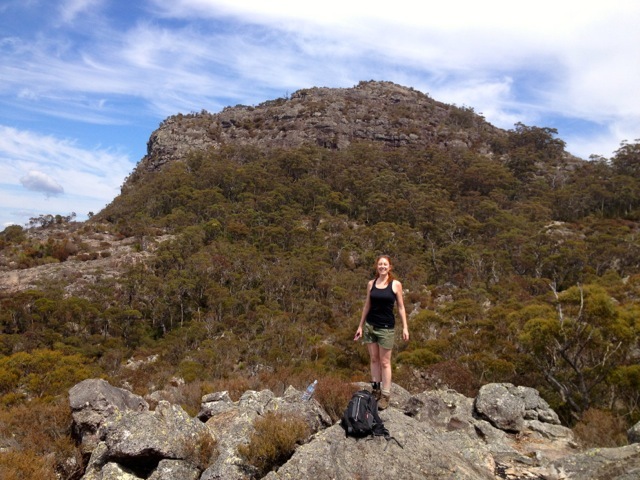 The four of us climbed slowly up the slope of the shorter rocky spire beside Mt Maroon. The dirt, rock and root steps led us steadily through the sparse tree-covered slope, giving the occasional peek at the surrounding land and the rocky parapet of the main mountain. 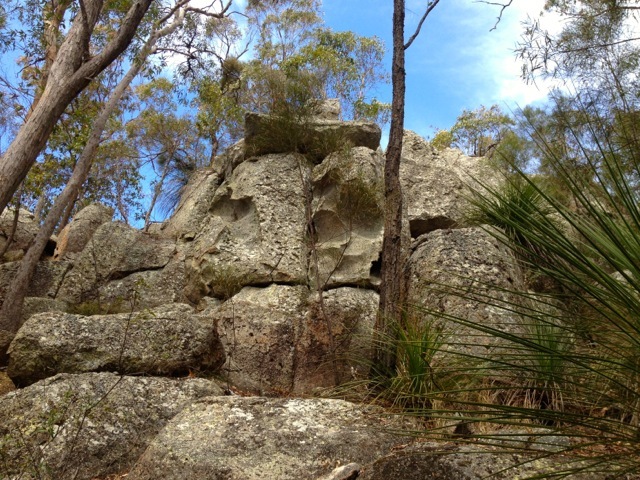 Grass Trees began to appear as we climbed and the terrain turned more rocky. We climbed around it and over a small series of boulders. It was here that the trail changed. 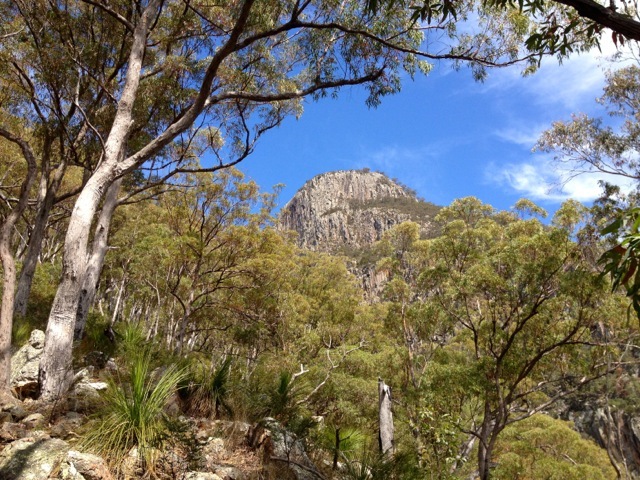 We headed down across the top of a steep gully towards the main rock face. 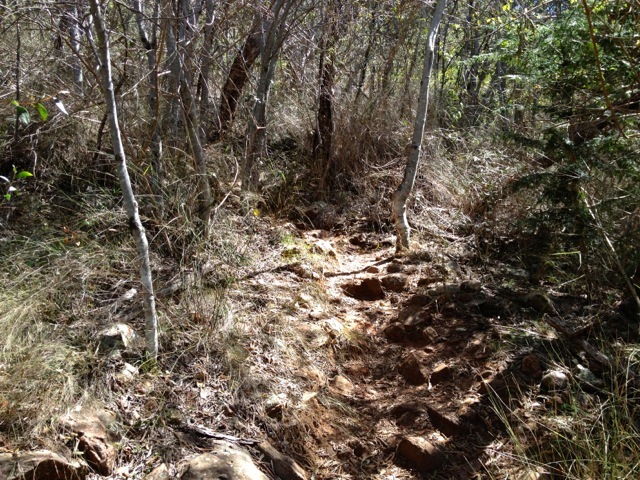 The trail became sand mixed with ash from a fire several years earlier and soon began to climb again. The trail turned quite steep and there were several places we had to scramble over rocks. This was the hardest part of the hike and we quickly made our way up through it, working our way along the rocky wall. Small bamboo-like trees began to grow in a grove as we climbed through more rocky out crops until we eventually arrived at the saddle where the trail flattened out. To our left, a short path led to a large flat rocky out crop. We climbed it and at the top we had out first real taste of the views. We also discovered that the rocky parapet we’d thought was the summit was only the middle peak of three. The top peak beckoned us higher. …and 360º views across the fantastic landscapes around us. Just to the south on the state border the peaks of Mt Barney. 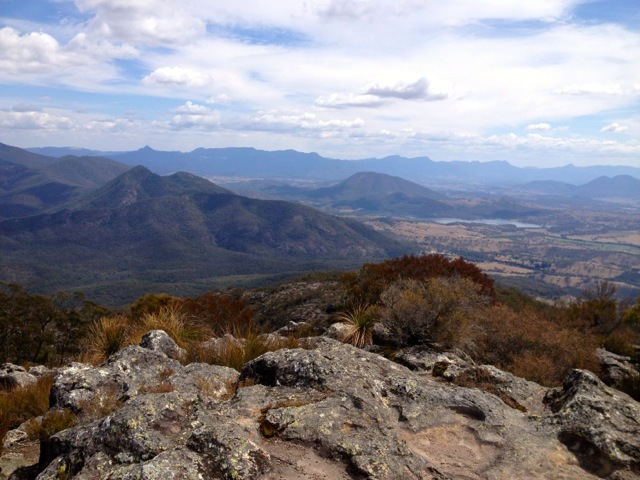 To the side of Mt Barney and across the border is Mt Lindsey with its unique rocky spire. 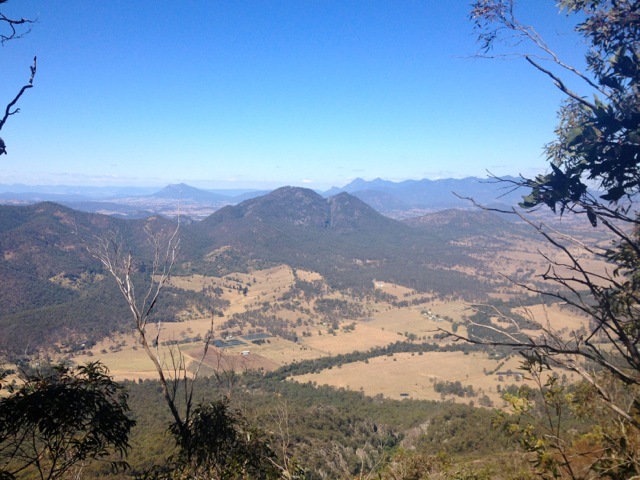 To the west we could see Mt Greville, Mt Edwards and Moogerah Lake. 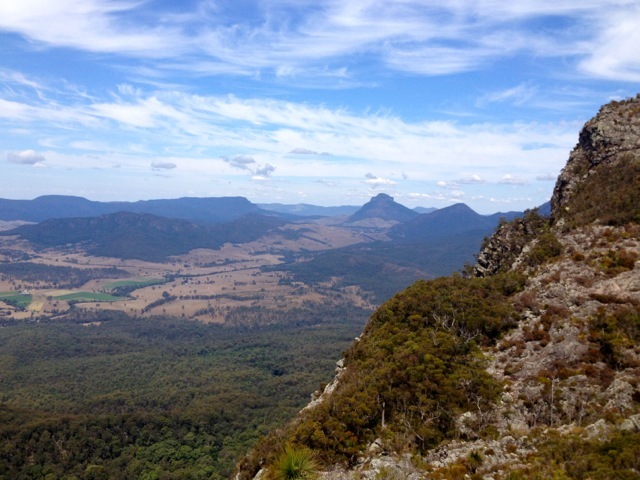 To the north, the parapet of Mt Maroon, the middle peak being part of a rocky crater. 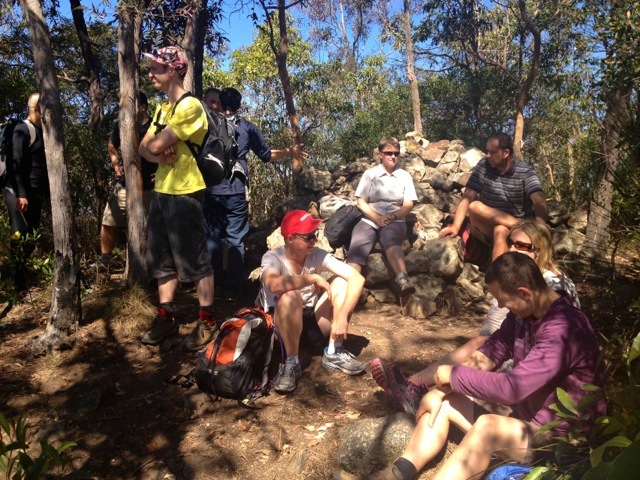 The only downside of the Mt Maroon climb was the number of people waiting for us at the top. Several groups had all decided to climb the mountain today and there was a veritable party going on up there. The four of us kept to ourselves as we ate lunch. Then after 30 minutes of the glorious view the thought of a beer persuaded us to begin our descent. The steeper parts were trickier coming down but didn’t cause any problems. After about 90 minutes we arrived back at the cars and headed back to Rathdowney for a well-earned beer. 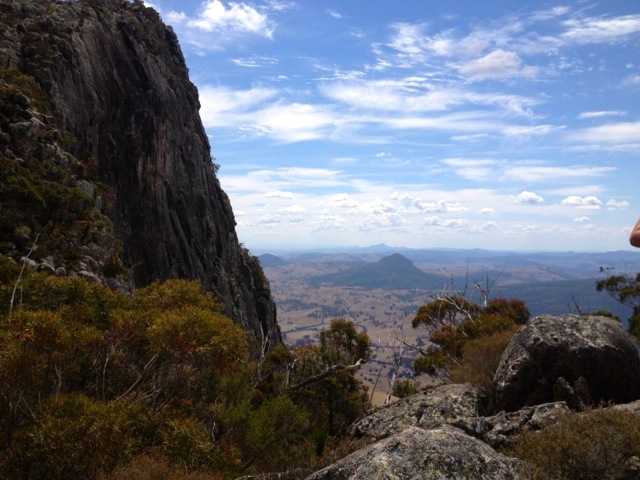 This weekend I’m heading to Mt Barney National Park where I have arranged to walk two different hikes. Today, I am taking a group on a the casual walk to the Lower Portals, and then tomorrow, I am taking another group to climb the more intense Mt Maroon. I organised to meet the group at the little township of Rathdowney. 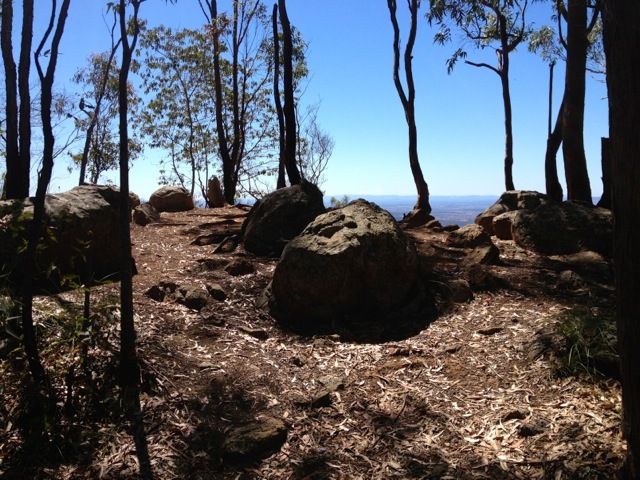 Once we had all arrived, we convoyed to the car park at the base of Mount Barney. 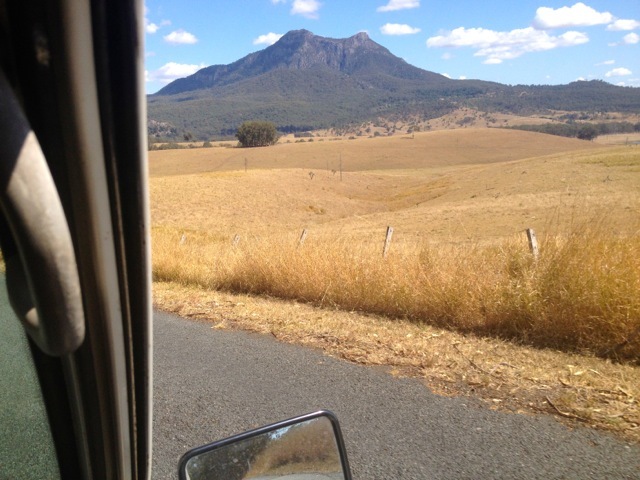 As we drove we passed the rocky face of Mt Maroon, which beckoned me for tomorrow’s climb. From the car park it’s 3.7km to the Lower Portals, a set of stony passages where water passes when it comes down the mountain. 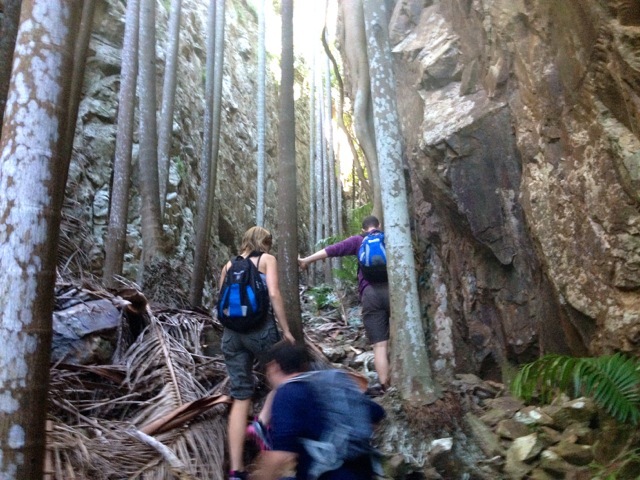 With Mt Barney above us to the south, we headed into the light forest on a rocky trail. We climbed over small hills on the way through the forest. 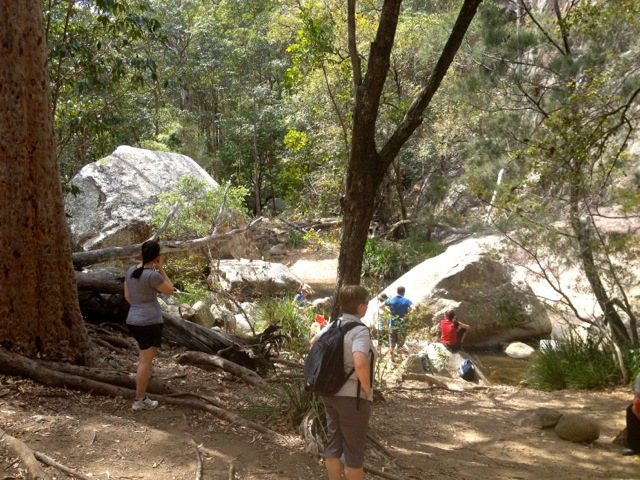 To be honest, other than the occasional view of Mt Barney through the trees, the walk wasn’t very interesting. 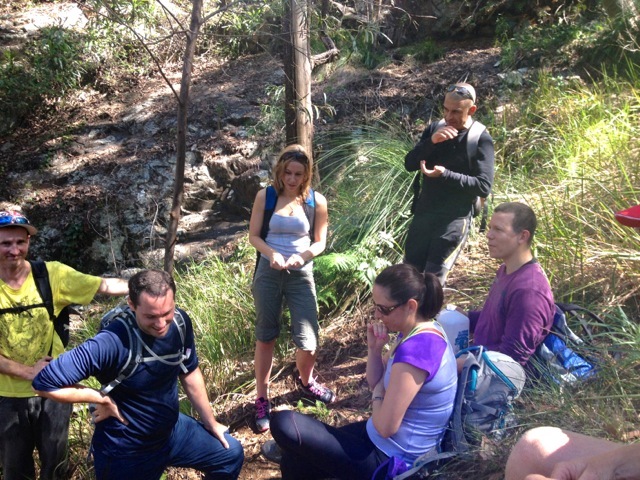 But the group made up for that and after 45 minutes we stopped at a rocky stream for a break. After our break we crossed the stream and walked south along the bank for another 10 minutes before trail ended abruptly. 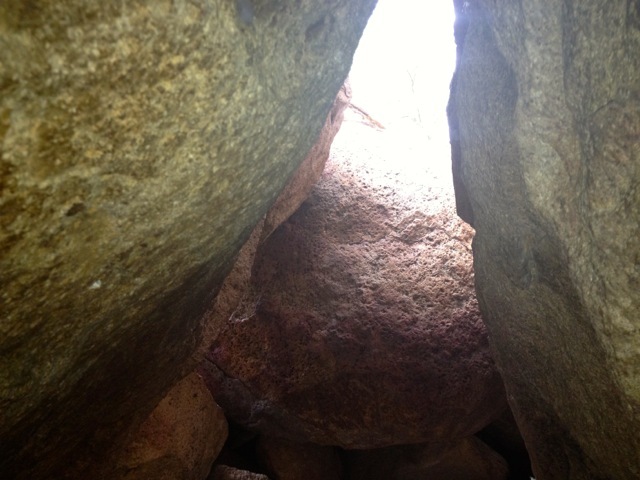 Massive boulders blocked our path further along the stream and we figured we had reached the Lower Portals. It was all very anticlimactic. Until… We located a gap in one of the rocks and climbed up through it. Like a secret garden, the true beauty of the Lower Portals appeared. Beyond the boulders and perhaps a dozen metres along, the stream opened up to a pool with a gorge on the far side. And at the far end of the small gorge, the Lower Portals. 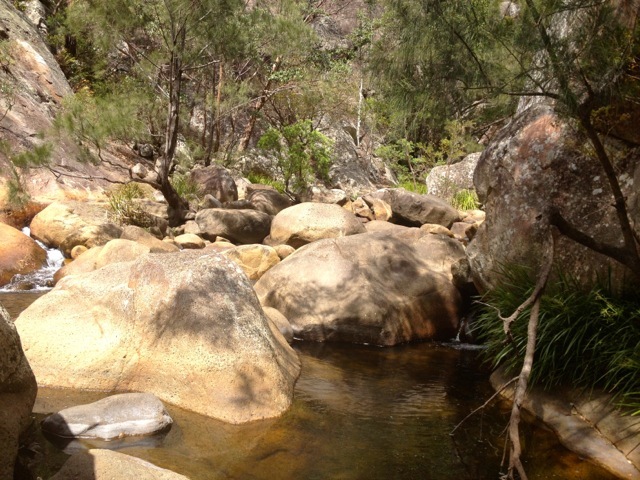 The tall rocky sides of the gorge were beautiful as a backdrop to the pool and stream. 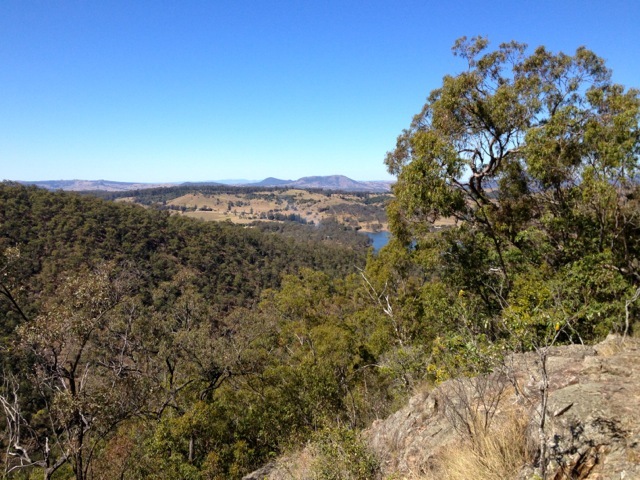 We hung around for half an hour more, taking in the views, before returning along the same trail to the car park. 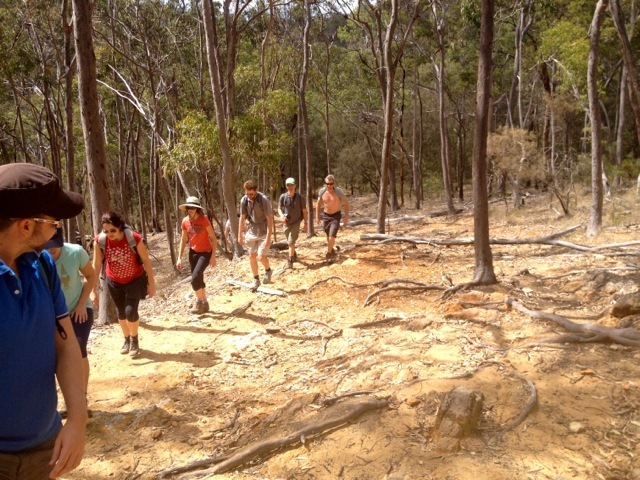 Today I arranged for my hiking group to join me to climb Mt Greville. Mt Greville is across the lake from Mt Edwards and has a harsh looking rocky side. 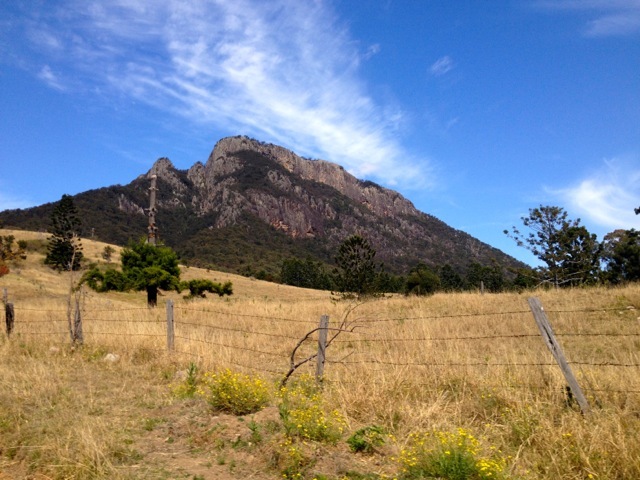 The mountain is also known as kangaroo mountain, as from certain angles it looks like a grazing kangaroo. For my last group hike I ended up with nearly 45 walkers. 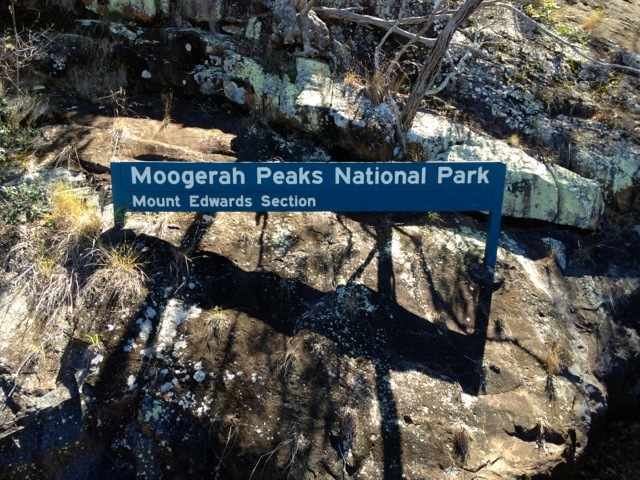 With Mt Greville being a more difficult climb, I decided to limit the numbers. This time 16 people registered and of those, 13 arrived at the usual meeting place in Aratula, where we drove as a convoy to the car park. The initial part of the walk is a vehicle track heading across the grass at the base of the mountain. The vehicle track quickly turns into a rocky trail and cuts up a gently slope to a sign pointing us towards Palm Gorge. This would be the last sign we would see today. From here the track gets very rocky and steep. Thankfully most of us are in hiking boots. The slope intensifies and we begin to see a stone cliff wall ahead that looks to block our progress. As we approach the wall, we notice a small channel of rock to the right leading to a rocky gorge. There are trees dotted around and dead palm fronds everywhere. 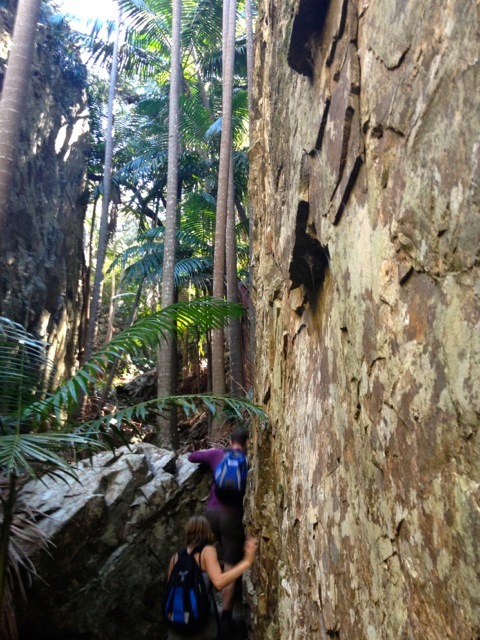 We pick our way up through the gorge which at times is barely two metres across. There was a deep sense of beauty during our climb and a sense of being small. 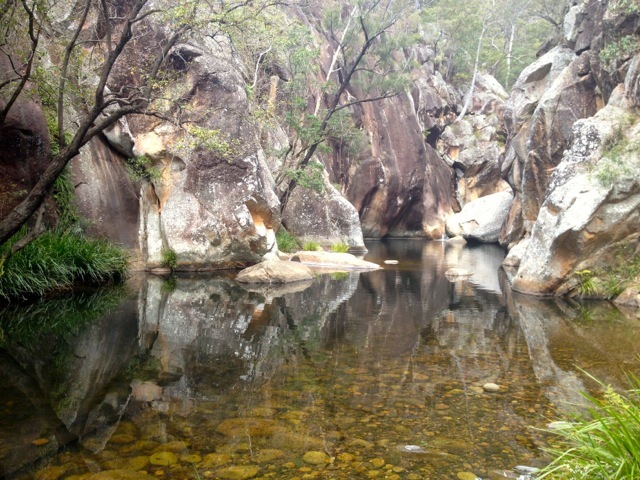 Before we even reached the top, this gorge helped to make Mt Greville one of my favourite hikes in South East Queensland. We emerged from the gorge covered in sweat and rested for a few minutes to let the stragglers catch up. When we set off again it felt like we were somewhere else. 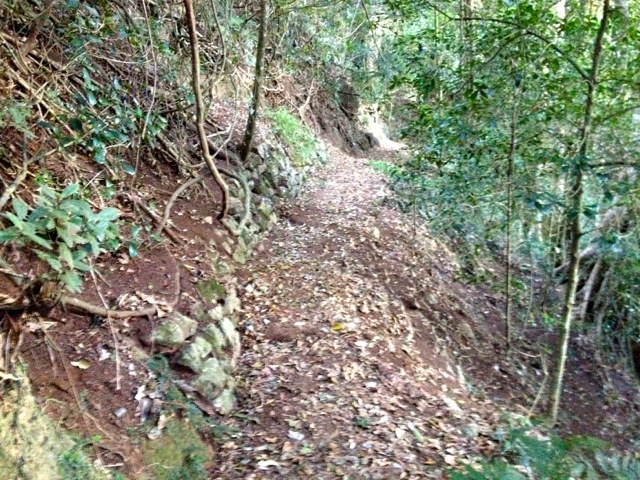 The rocky gorge gave way to a tree-lined dirt trail with grass along either side. 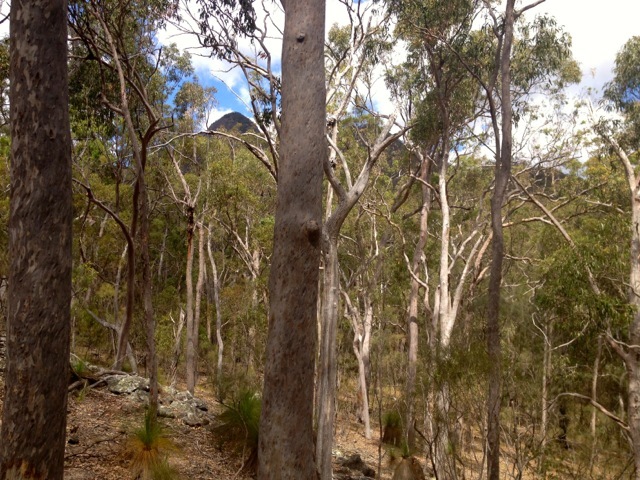 We could see the top of the mountain vaguely through the tree canopy to the north. 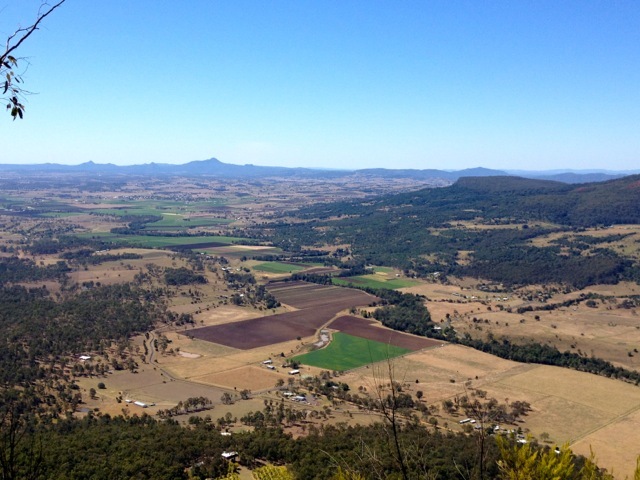 The climb continued more steeply and we quickly arrived at a lookout giving views across to the ramparts of the Main Range. 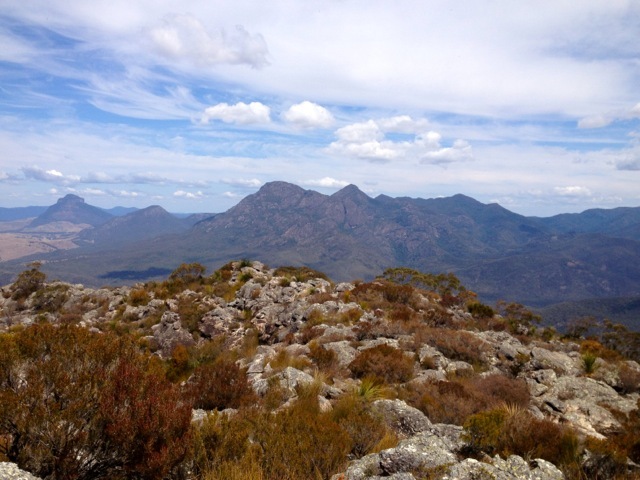 As we neared to summit, Grass Trees began to appear as they tend to do near the top of most peaks in this region. We pushed on and before we knew it we arrived at the large cairn at the top, where we shed out bags and rested. The views from the top were minimal, hidden behind the trees, but a couple of short tracks lead down to viewing points on either side. 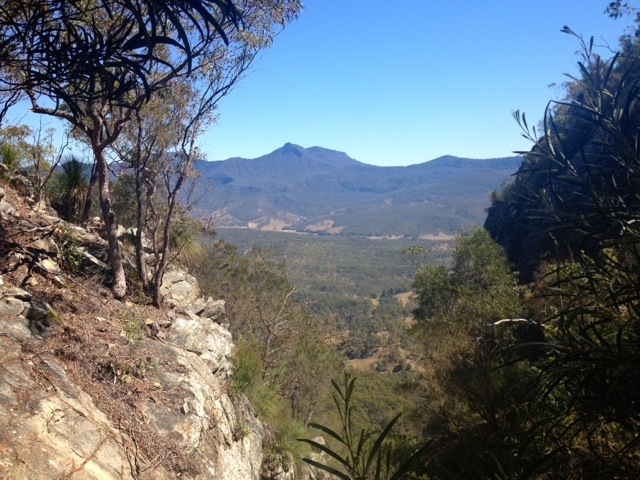 To the north, I got down to a rock slab that gave me good views along the Main Range and Mt Edwards beside Moogerah Lake. Along the short southern track I was awarded with views over the mountains to the south, including Mt Barney in the distance – the site of my next walk with the group. 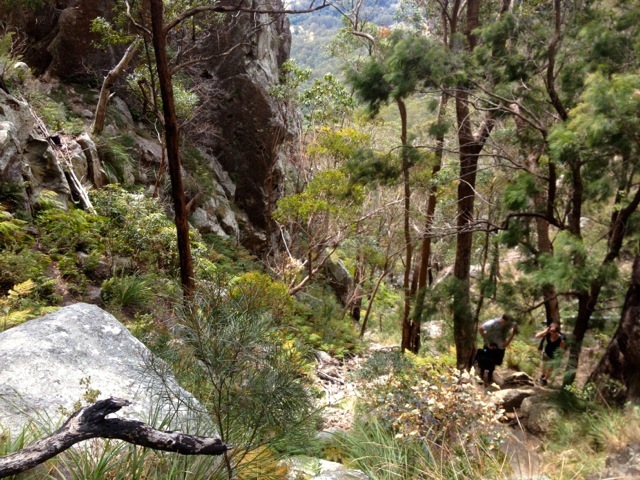 On the way down, we retraced out steps to the top of the Palm Gorge but took an alternate route. 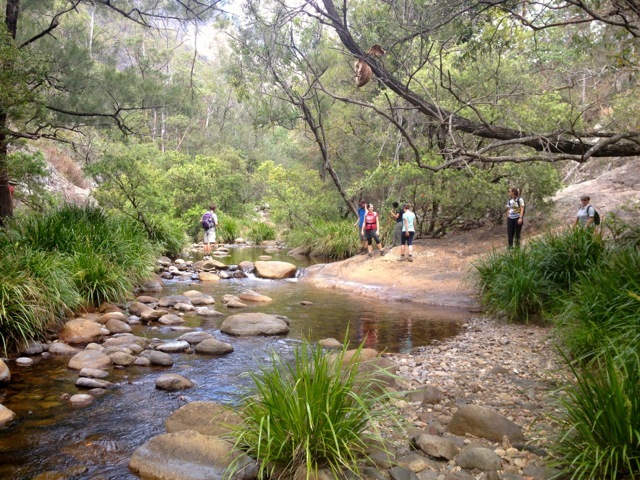 The South East track leads through some dense bush and open rocky slopes. It can be a little confusing going down, but with plenty of eyes, we easily spotted the trail of cairns and orange arrows. This slope proved more picturesque and allowed for a view to the south, west and occasionally to the north. We stopped here and there to look down a gorge or from the top of a cliff. The slope was sometimes steep, but you gotta love the grip of quality hiking boots. We soon dropped back into the forest and followed an easier track until we came to the previously mentioned sign. From there it was fairly flat and easy-going back to the car. 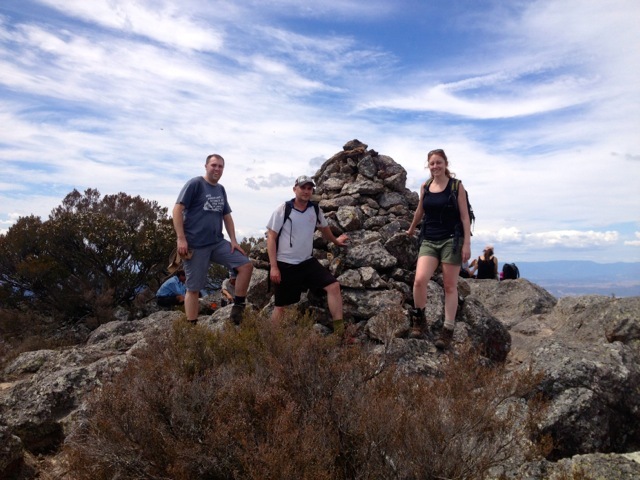 Mt Greville was a most enjoyable climb with a great group of people. I highly recommend this climb to anyone who is fit enough to climb it. Afterwards the group stopped in to the Aratula Hotel for the obligatory post hike beer. 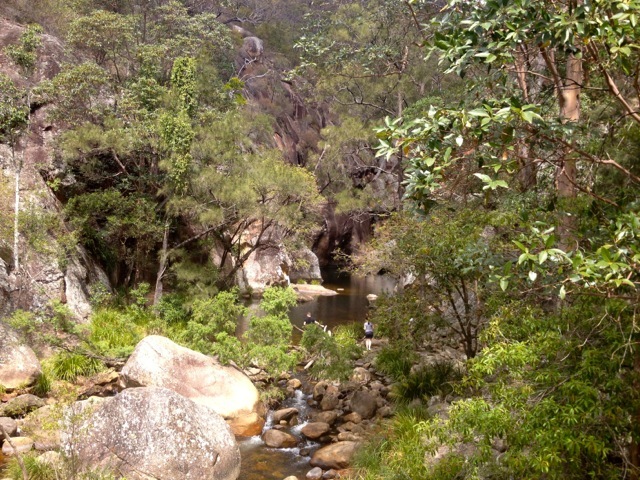 Next week, a bit of a rest and a couple of minor walks in D’Aguilar National Park. Happy first day of spring in Queensland! 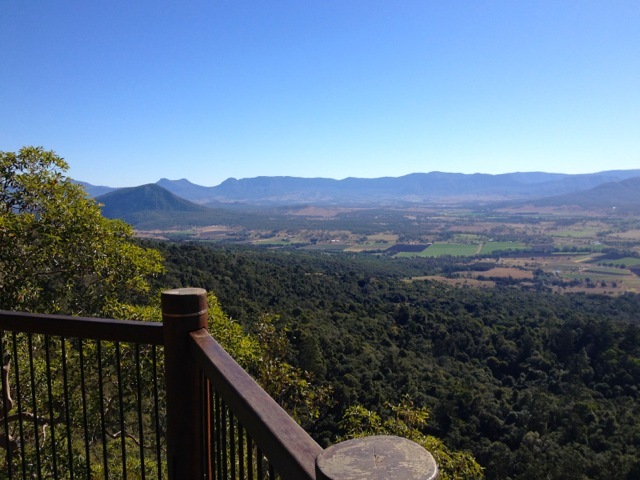 This weekend I’ve driven out to Moogerah Peaks National Park, about an hour south-west of Brisbane, to explore some of the vocalic peaks in the park. Today I’ll be exploring two of the easier ones, while tomorrow I tackle the more challenging Mt Greville with my hiking group. 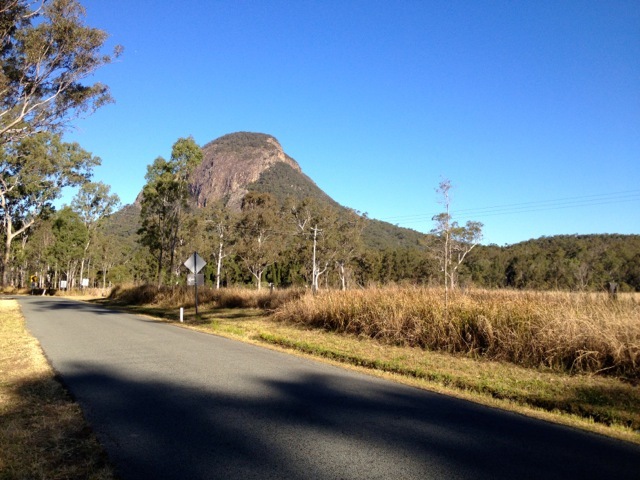 From Aratula, my usual starting point for walks in this region, Mt Edwards’ tree covered cone can’t be missed, it’s right there at the end of town. 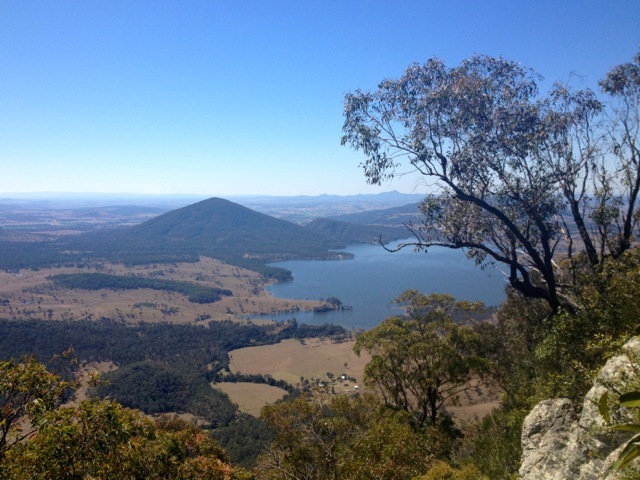 To get to the trailhead, you drive about 10 km from town to the Lake Moogerah Picnic area overlooking the lake. The lake itself isn’t huge, but it’s larger than Lake Perseverance in the Crows Nest National Park, where I was last weekend. It’s beautiful although the noise pollution from jet boats can be heard for kilometres around. 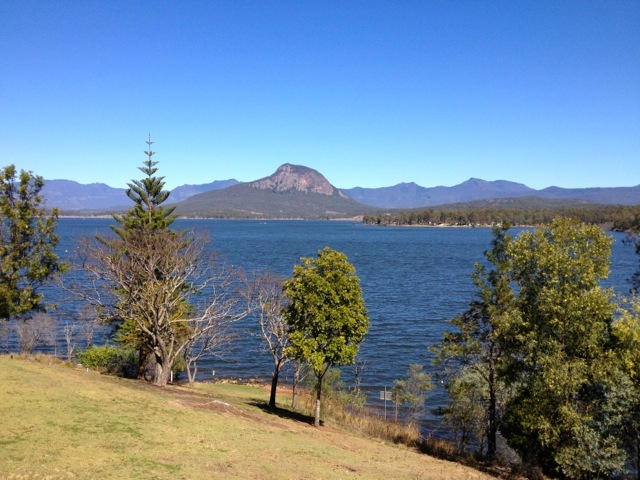 Mt Greville rises from the far side of the lake with the Main Range Ramparts behind it. At one end of the lake is a dam which must be crossed to get to the trailhead. 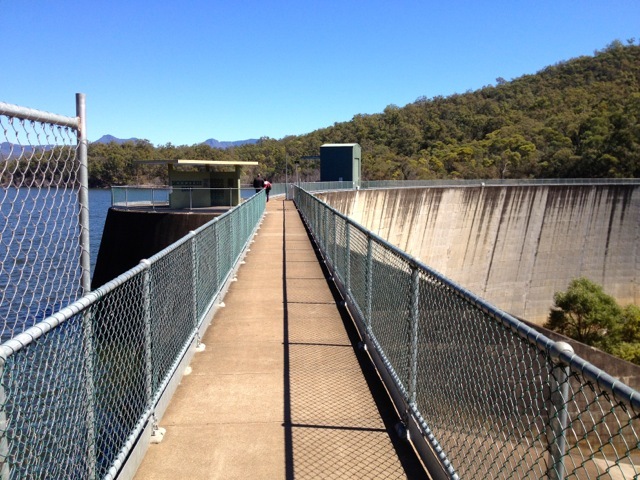 The dam gives better views of the Main Range and Mt Greville, but also of Mt Edwards and it’s companion, Little Edward. 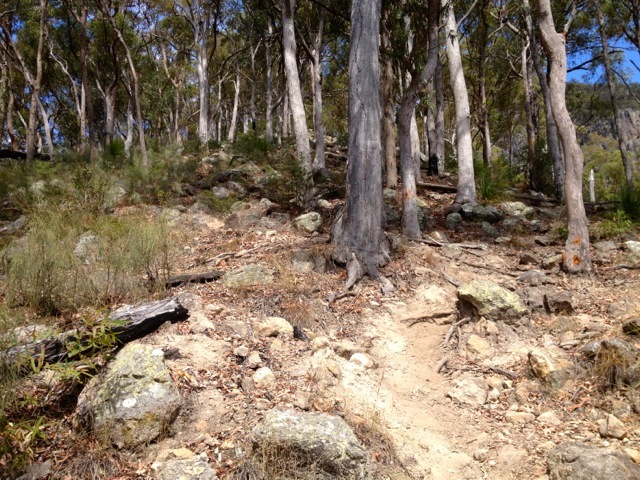 The trail climbs at a fairly steep angle from the beginning, initially along a sealed path then up dirt steps with plentiful tree roots for stability. 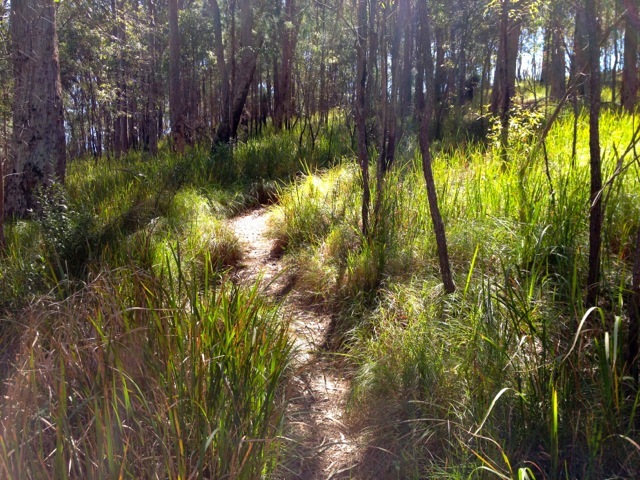 The trail cuts through the trees and gives a sprinkle of sun as you go. About a kilometre in, a family came back the other way, with two young boys and their father wearing sandals. 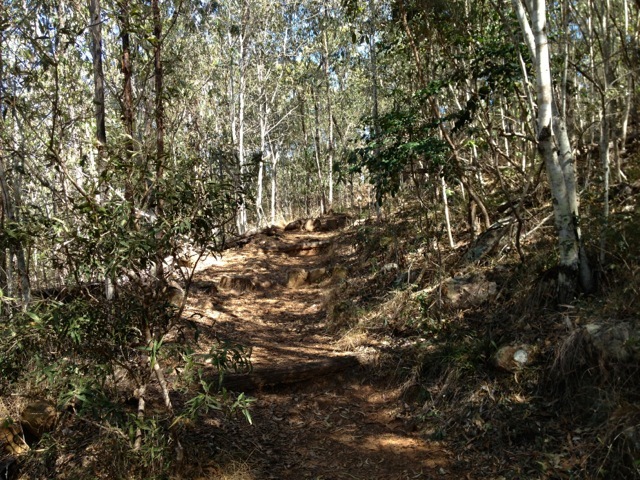 The steep steps continue, weaving their way through the trees and up the side of the mountain. Other than the vista of Little Edward it’s difficult to get good views during the climb because of the tree cover, with the occasional view back at the lake. The trail pushes onwards without respite at the same steepness as it began. 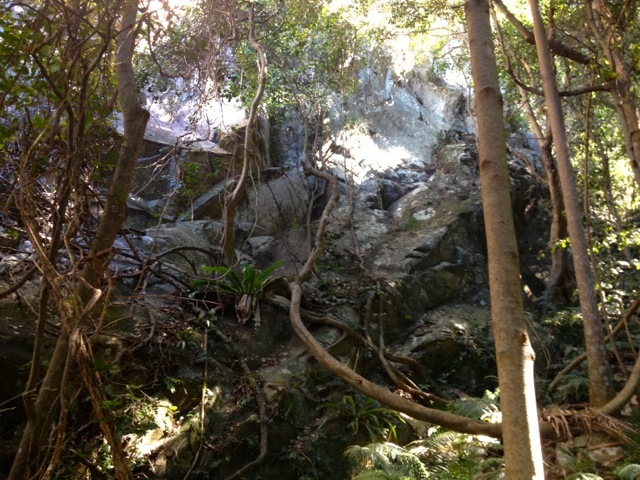 This constant climbing is the hardest thing about this walk, but it certainly gets the sweat flowing. …before emerging at the summit. A trail leads along the top in both directions to different viewing points, all giving pretty much the same amazing views north. It’s a shame trees obscure views in all other direction as I would have liked to have seen better views of the lake or along the Main Range ramparts. I hung around at the top for half an hour to dry my shirt and have lunch before heading down again. On the way down, I heard a noise beside the path and stopped to watch a foot long grass snake slither past. It was the cutest thing and must have only been young for its size. I was back at the van 2 hours after I’d started and after a quick stop at the cafe for an ice block, I was off to the next spot for the day. Mount French is used by rock climbers as the cliff faces to the north are good for technical climbs. 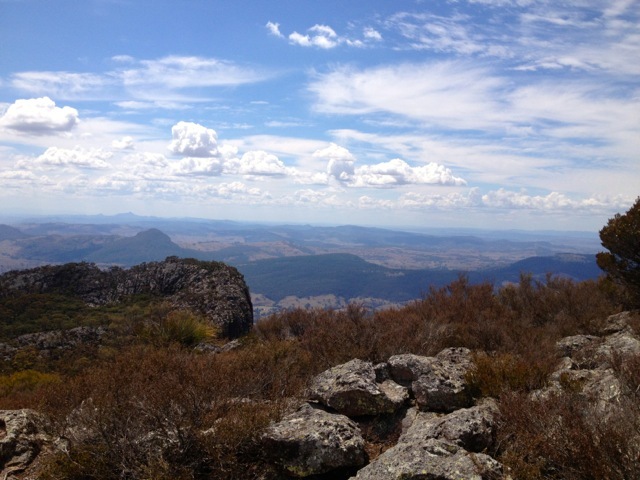 The top of Mt French is long and flat with a car park at its summit. I walked to Logan Lookout and along the cliff tops for a few minutes admiring the views. I wandered back along the other side, where there is a short loop and some views of the Main Range. 20 minutes later I was back at the van and heading off again. With a couple of hours of sunlight to kill before I nestled down for the evening, I decided to head back out to the Main Range and do one of the short walks I hadn’t previously done. This one skirts the cliffs at the base of Mt Cordeaux. From the beginning it’s easy to tell you are in the rain forest, as the heat of the day just disappears and it feels rather wintery. The walk wasn’t hard but to keep warm I had to walk fairly quickly. There were some short views west from the mountains but most of the walk is along the side of a fairly sheer tree-lined bank under the cover of trees. 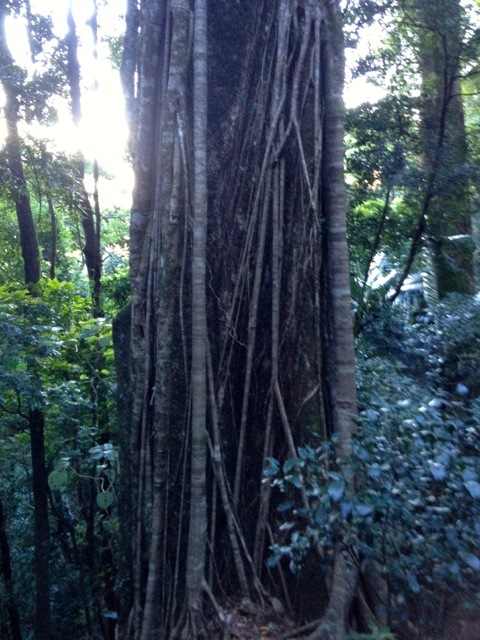 There are some large specimens here although many have been attacked by strangler figs. 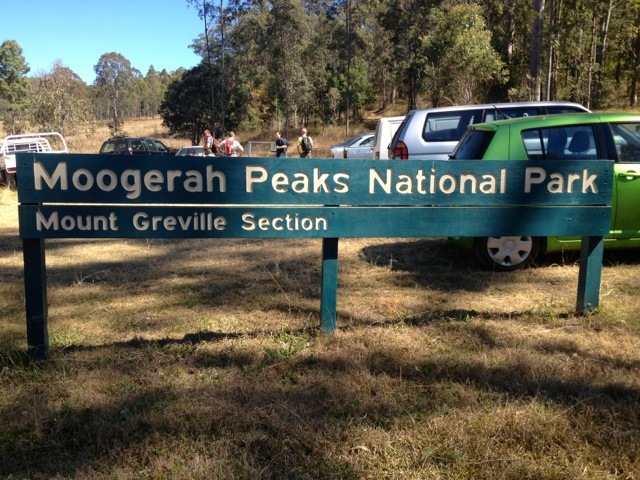 After an hour I arrived back at the van and headed off to the camping ground to get ready for Mt Greville tomorrow.